It makes for a great reading when Cydia is refreshed and the list of available packages is populated with new and interesting offerings. It’s even better to see that a number of developers are now starting to take an interest in enhancing Apple’s native iMessaging service. The new SelectiveReading tweak is one of the latest in a line of third-party enhancements for the fruit company’s fabulous messaging platform. The title of the new package pretty much gives away its intended functionality. 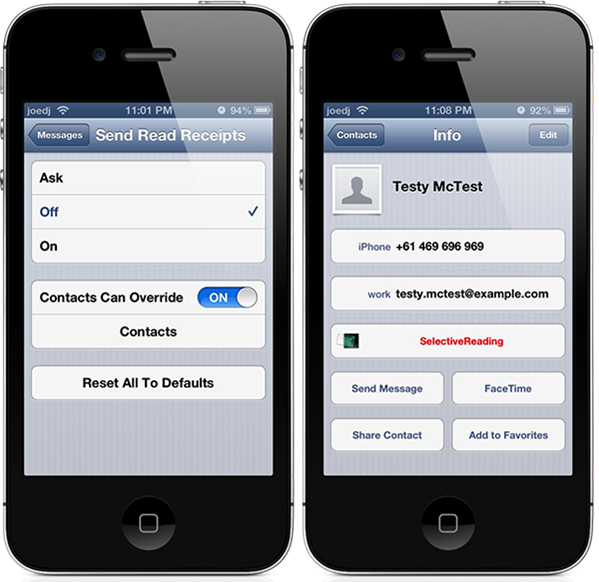 In a native installation of iOS, the user simply has the option to enable or disable read receipts for sent iMessages. In the simplest terms it means that either everyone sees that you have read their sent message, or no-one does. SelectiveReading changes that default functionality by putting the power in the user’s hands. Read receipts have been around for quite some time with text messaging, nothing particularly exciting about them. The problem is that it has always been an all or nothing situation, and in some cases some networks haven’t even supported them. The package essentially hooks into the messaging of the system and implements a new ‘ask’ feature relating to read receipts. Still, the ‘on’, ‘off’ or ‘ask’ options may work for a lot of users but for those who hammer messaging on a regular basis then things can get a little cluttered with consistent alerts to ask whether read receipts should be sent. SelectiveReading solves this problem by adding a contact based override system that allows the user to set the specific rules on a per contact basis. If you prefer to have the read receipt option set to ‘off’ by default but still want a few select contacts to be informed when their message has been read then this option is perfect. I personally always have the read receipts turned off as I prefer to reply to messages in my own time without the sender knowing I have read the information, but with that said it’s always great to be able to have the power to choose on a per contact basis. SelectiveReading is available as a $0.99 download from the Big Boss repository and is compatible with iOS 5 and 6.